Pattis Main Man (4) and driver David Miller hold off Wittyville (2) to take the $129,706 (div.) 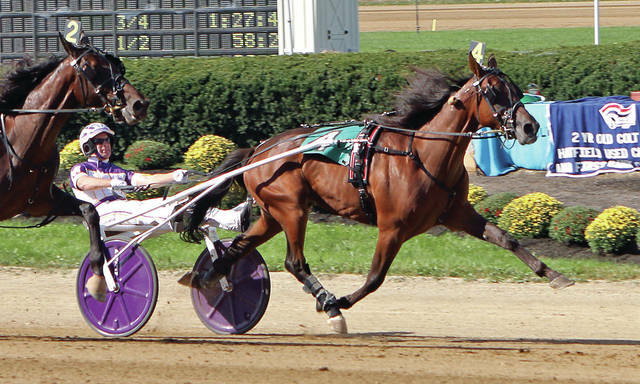 Ohio Breeders Championship for two-year-old colt trotters Tuesday at the Delaware County Fair. The $129,706 (div.) Ohio Breeders Championship for two-year-old colt trotters highlighted the Tuesday action at the Delaware County Fair. David Miller, Delaware’s all-time leading driver, made his presence known early when he piloted Pattis Main Man to victory in the first division. Pattis Main Man led gate-to-wire, but had to hold off a late rush by the bettor’s choice Wittyville (Chris Page) by a neck in 1:56 3/5. The freshman son of Manofmanymissions is owned and trained by Mike Sowers of McArthur, Ohio. Pattis Main Man was bred by Midland Acres and has five wins on the season. Never Say Uncle (Aaron Merriman) and Rose Run Urban (Peter Wrenn) completed the superfecta. With the win, David Miller increased his all-time win total at Delaware to 224. In the second $64,853 division, Kayne Kauffman used a patient drive with Cumberland Gap to win in 1:57 1/5. When the gate wing opened, Oh So Pine (Dan Noble) and Cumberland Gap battled for the early lead. The eventual winner yielded to Oh So Pine through the opening fractions of :28 2/5 and :58 2/5. Cumberland Gap took the lead just before the ¾ mile pole in 1:27 3/5. Oh So Pine tried to rally one more time in the lane but came up a ½ length short. Cumberland Gap won for the sixth time in 11 seasonal starts for owner/trainer Renee Bauslaugh of Delaware and breeder Charles Stillings of DeLeon Springs, Florida. The final time equaled the Wishing Stone colt’s lifetime mark. Today’s 20 race Jugette Day card will kick off at 11 a.m.